A great patio will serve as an extension of your living space and be the perfect location for springtime parties, afternoon glasses of iced tea, and sunset dinners with your loved ones. 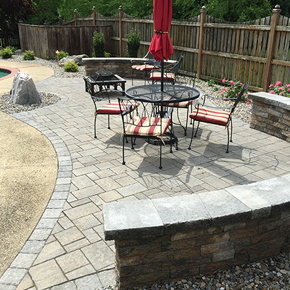 Carroll Landscaping has decades of experience customizing patios to meet the needs of our customers, seamlessly integrate with the surrounding landscaping and hardscaping, and add something special to properties throughout Maryland. 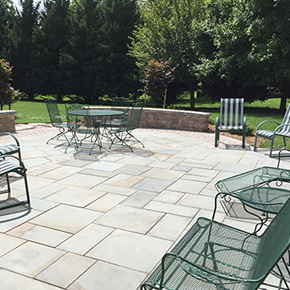 Since patios don’t require much space, they are a perfect match for every yard. Patios allow you to fully enjoy your landscaping, water features, and landscape lighting every season of the year. A patio installation offers a healthy return on investment and adds usable living space to your property. Since patios don’t need rails or much added structure, they are very versatile and easily customizable. Patios are typically constructed from materials that are low maintenance, like pavers or stones, so you won’t need to spend much time to keep it looking great. Do you love entertaining outdoors but hate leaving all of your guests inside while you tend to the grill? An outdoor kitchen can easily be installed as part of your patio area so that you can grill while you relax and spend time with family. Outdoor kitchens and grill islands can be as comprehensive and complex as you like, or as simple as a bar and place to put your grille. Our designers will work with you to create the perfect outdoor kitchen or grill island to match the way that you want to use your patio. If you struggle to enjoy the outdoors during the colder months or once the sun sets in the summer, an outdoor fireplace or fire pit is the perfect match for your landscaping. Patios are ideal for fire pit installation for safety reasons, so you can enjoy the outdoors while warming up by the fire. Not sure which fire feature is right for the outside of your home? Our landscape designers will work with you to ensure a safe and suitable fire feature. Is your favorite part of the outdoors getting to kick back with a great book or glass of wine? Water features can maximize your outdoor enjoyment with their tranquil sights and sounds. For the ultimate in relaxation, install a pond with a gentle waterfall alongside your patio so that you can enjoy the fish and flowers while you unwind. Our patio installation process has been refined over the years to ensure that you end up with a perfectly designed, seamlessly installed final product. From the initial design meeting to the installation itself, you will feel taken care of throughout the process. 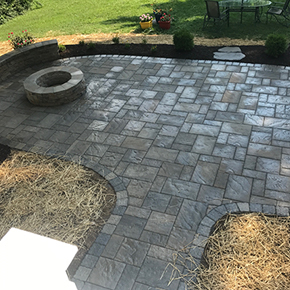 With all of our projects, we take the time to assess your existing landscaping, hardscaping, and drainage so that your new patio will not negatively affect anything else in your yard.